Our 5-year old Bonus Boy loves baking with me, and muffins are an easy favorite to put together. I keep a huge container of Homemade Muffin Mix on hand so that he and I can stir together any muffin variety we want. 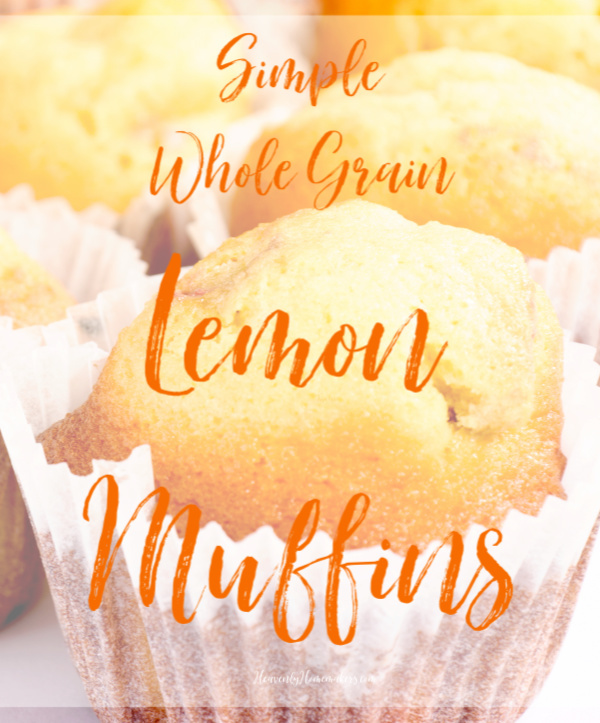 We recently experimented to make Lemon Muffins and the results are super tangy and fun! 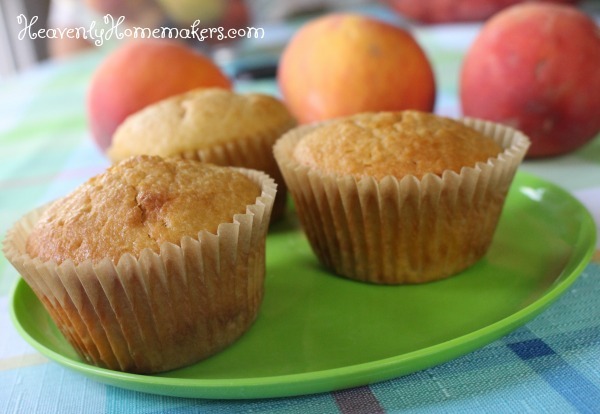 Note how simple it is to make muffin variations! I simply subbed out some milk for lemon juice in my basic muffin recipe. Suddenly we went from Plain Muffins to Lemon Muffins, without any trouble at all! Add egg, sour cream, milk, lemon juice, and melted coconut oil, stirring until ingredients are combined. 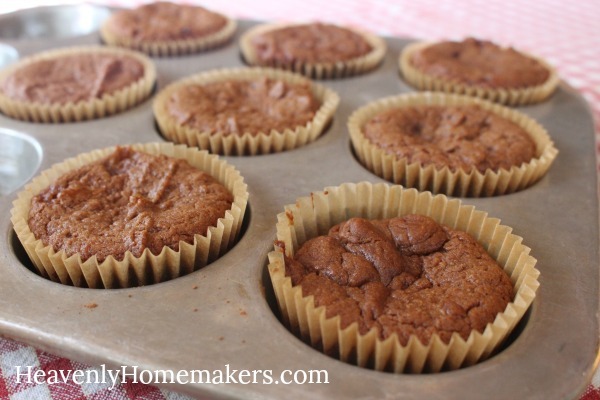 Scoop batter into 12-15 prepared muffin tins. Bake in a 400 degree oven for 18-22 minutes or until muffins are golden brown. 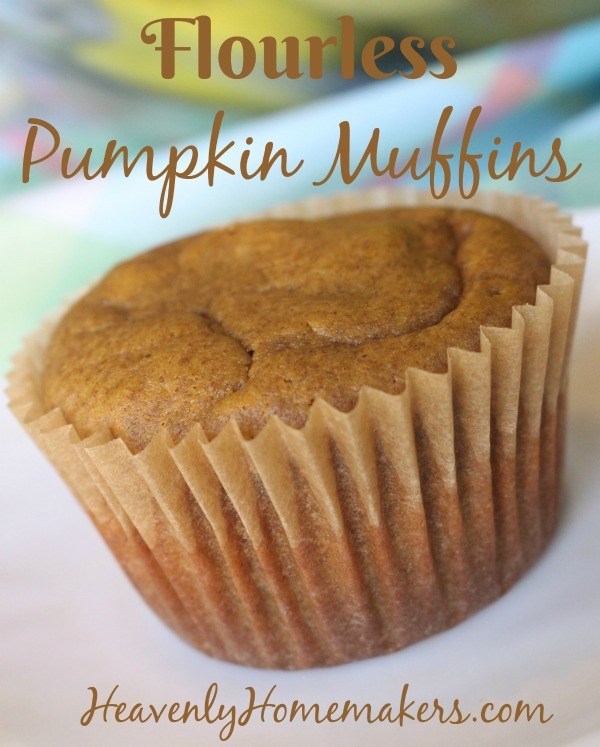 I love that these muffins are made with whole grain flour, but they are still wonderfully light and fluffy! This is because I use freshly ground soft white wheat (pastry flour). What a difference this makes! You can read more about whole grains and grain mills here. 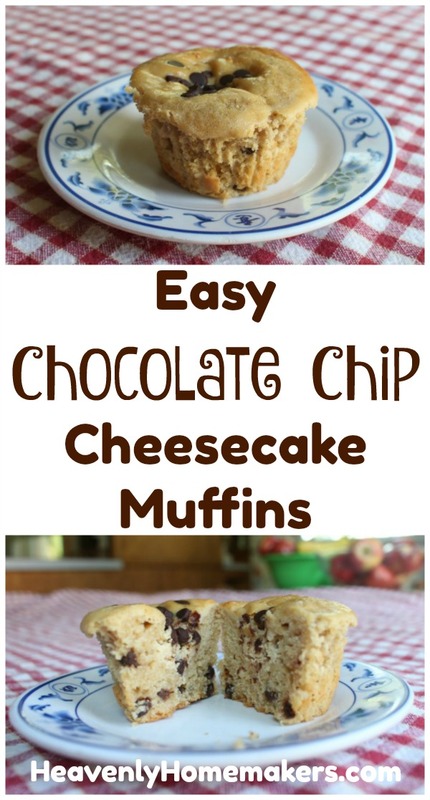 If you haven’t tried any of these varieties of Cheesecake Muffins, well, why?? They are beyond delicious! 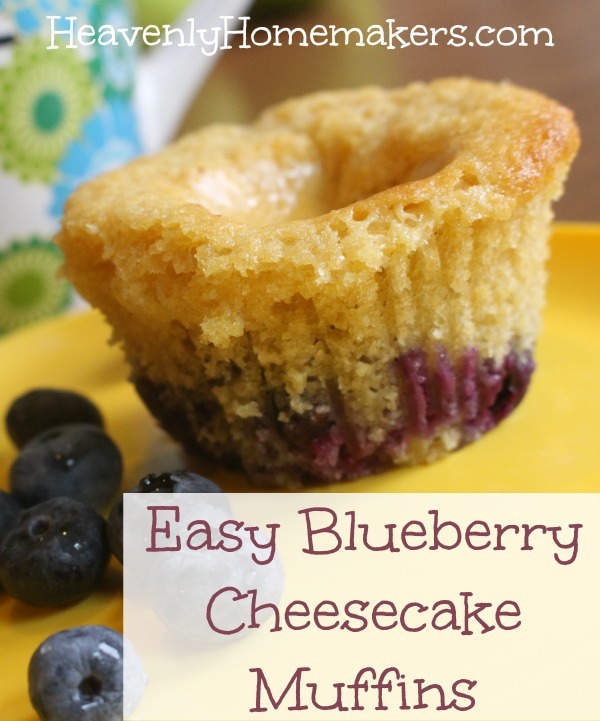 Perhaps it’s because you’ll been waiting for these Blueberry Cheesecake Muffins to show up? 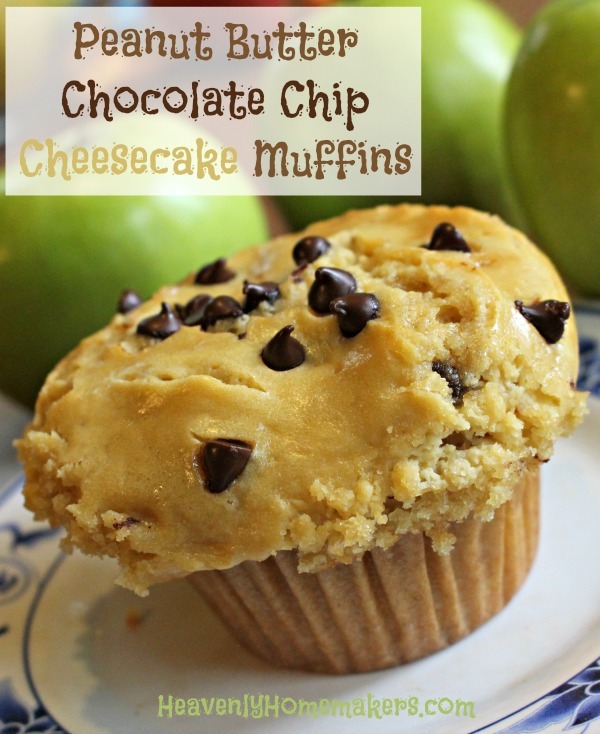 Having a layer of cheesecake on top of any of these muffins is incredibly delightful. And when you eat one whilst sipping coffee or tea? Well, it might as well become a National Cheesecake Muffin Holiday. Truly, the joy. It cannot be measured. And now for the latest! Prepare cheesecake topping by blending (in a blender or with a hand mixer) cream cheese, egg, maple syrup, and vanilla until smooth. Spoon 2-3 Tablespoons of cheesecake topping over each unbaked muffin. 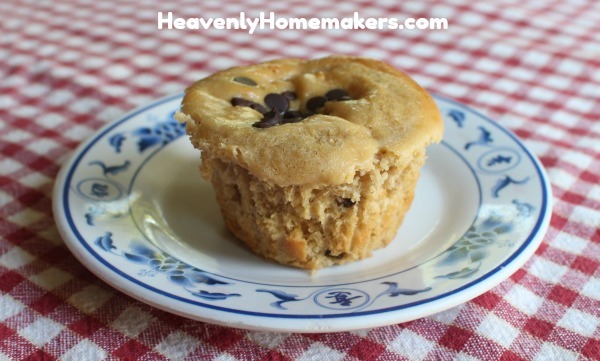 Remember these Peanut Butter Chocolate Chip Muffins? It occurred to me that I had not yet turned that recipe into Peanut Butter Chocolate Chip Cheesecake Muffins. So I quickly remedied this over-sight and am so happy to present you with these delights! Gently, though eagerly, pull off the top part of the muffin and set it on the plate. Eat the bottom portion of the muffin, enjoying every nibble but secretly looking forward to eating the cheesecake portion that is being saved for last. Start in on the top part of the muffin, smiling like a kid because every bite is filled with muffin, chocolate, and cheesecake, all at the same time, which is almost better than Christmas!! Sip coffee slowly throughout the entire process, because obviously. Add egg, sour cream, milk, peanut butter, and melted butter, stirring until ingredients are combined. 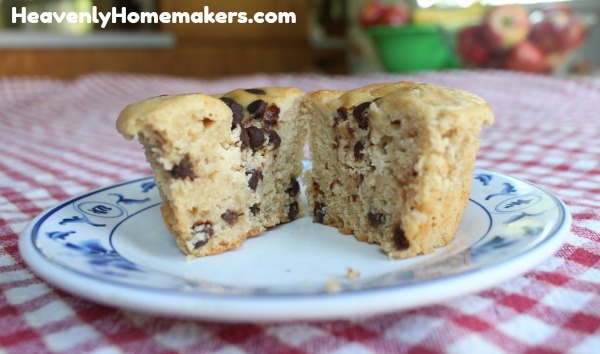 Fold in ¼ cup chocolate chips. Sprinkle chocolate chips over the top of each. 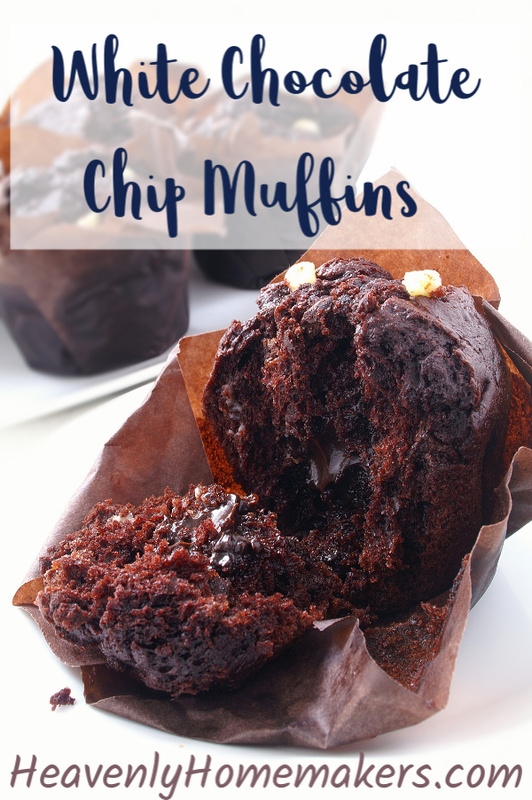 **You really must get our Simple Mixes to Save the Day eBook so you can save time and energy by using the Muffin Mix for this recipe instead!! I LOVE having these mixes on hand!!! When it comes to recipes, the simpler the better right? These Simple Whole Grain Chocolate Chip Muffins are fast and easy, and probably our very favorite. No one even realizes they are made with whole grains! 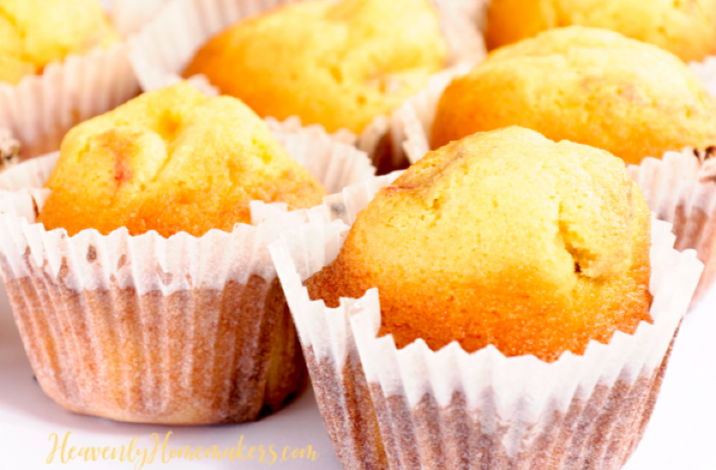 First, I must give a shout-out to the Muffin Mix in our Simple Mixes to Save the Day eBook. I use this muffin mix allllll the time as it is my very favorite. It seems silly to say that “this muffin mix saves me so much time!” because what does it really save me? Five minutes per batch of muffins? That, and brain energy, which is absolutely worth saving, is it not? But truly, having the Muffin Mix on hand means all I have to do is scoop out two cups of mix, then quickly add liquid ingredients. It makes muffins come together very quickly and easily. For me, it feels huge as every minute saved in the kitchen allows for more minutes doing other more important tasks! 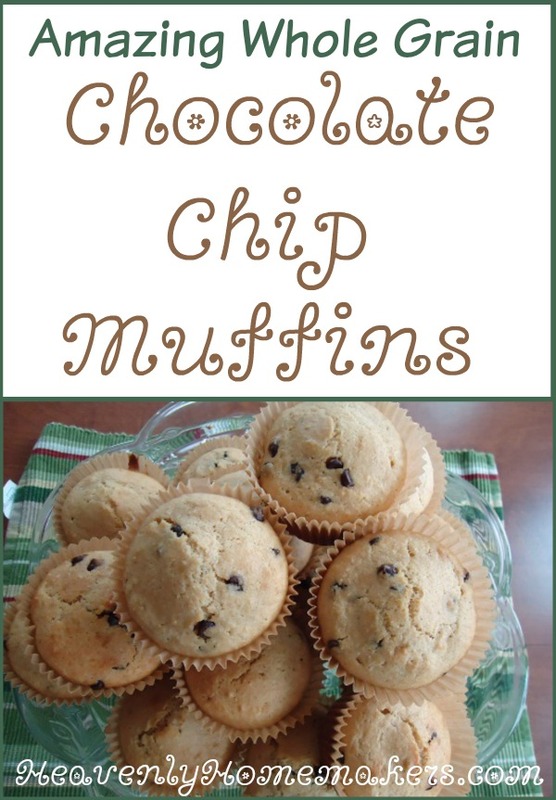 Below you’ll find the recipe you can use with or without the Muffin Mix. Note that there’s sour cream in these muffins. 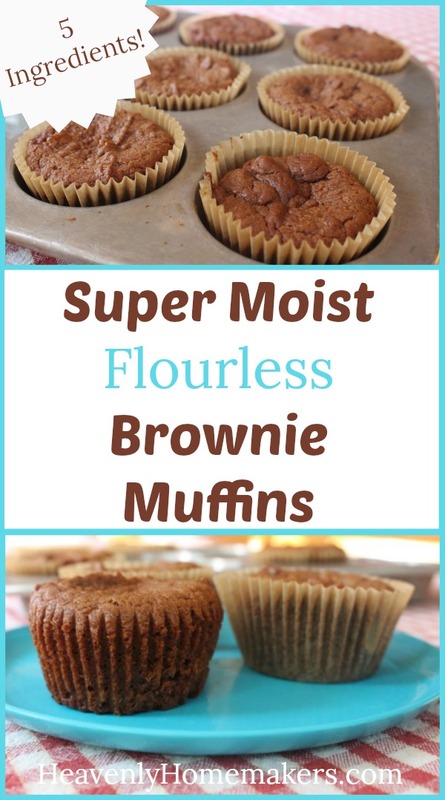 This makes the muffins moist and amazing! Use any whole grain flour you choose. 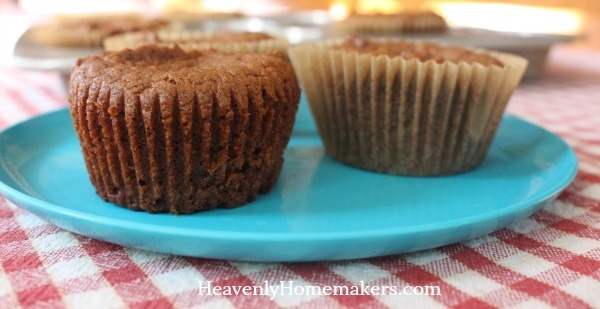 I use freshly ground soft white wheat in these muffins. It amazes me that using this flour for baking turns out products that taste surprisingly not whole grainy! Add egg, sour cream, milk, and melted butter, stirring until ingredients are combined. 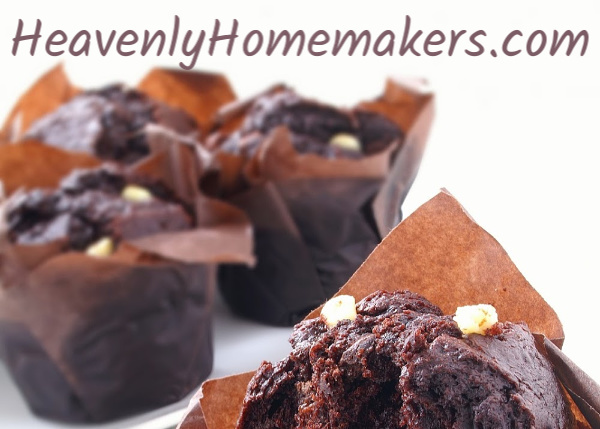 Want more great whole grain chocolate chip muffin recipes? 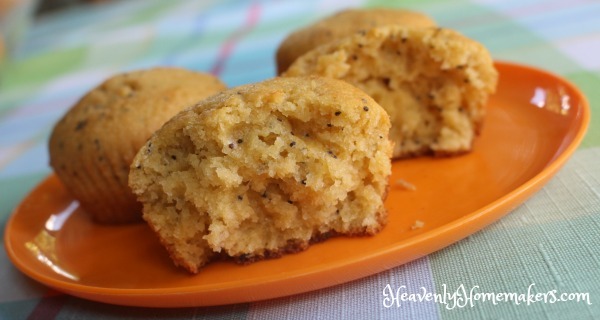 Oh my goodness, can you say “fluffy?” These Orange Poppyseed Muffins are so light and fluffy, the fact that they are made with whole grains and are low in sugar will be easily overlooked. Almond Extract: Do not skip this ingredient. It takes these muffins up a thousand notches. Orange Juice: The OJ gives a perfectly light citrus flavor that pairs perfectly with the almond extract. Poppyseeds: What even is a poppyseed? What exactly do these add to the recipe? I have yet to figure this out after all my years of baking. 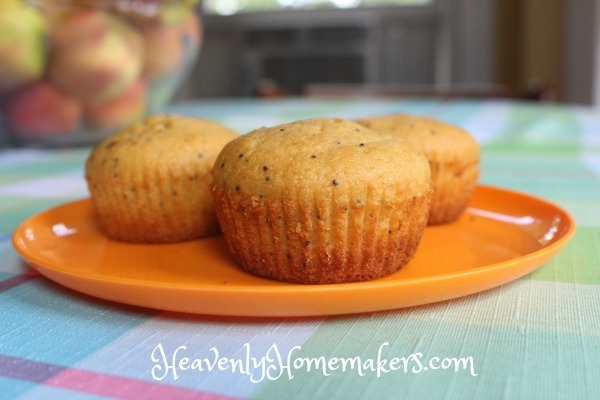 Many times I’ve considered leaving the poppyseeds out of my Poppyseed Bread or Muffins, simply because I can’t figure out the role they play (aside from the fact that a Poppyseed Muffin wouldn’t be a Poppyseed Muffin without Poppyseeds, and that’s what gives the bread/muffins their name). They have no taste, they don’t make the muffin rise, therefore they seem to only be an aesthetic ingredient. But no matter. Go make these muffins and then eat one (or three) fresh out of the oven with a glass of milk or a cup of coffee or tea. They are ridiculously delicious! Add eggs, orange juice, and melted butter. Stir until just mixed (but do not over-stir). 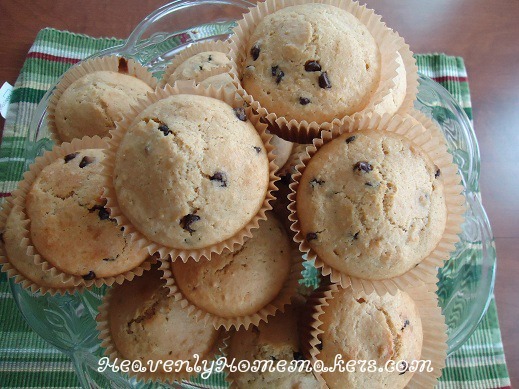 Scoop batter into 18-24 prepared muffin tins. Bake in a 400 degree oven for 18-25 minutes or until muffins are golden brown. 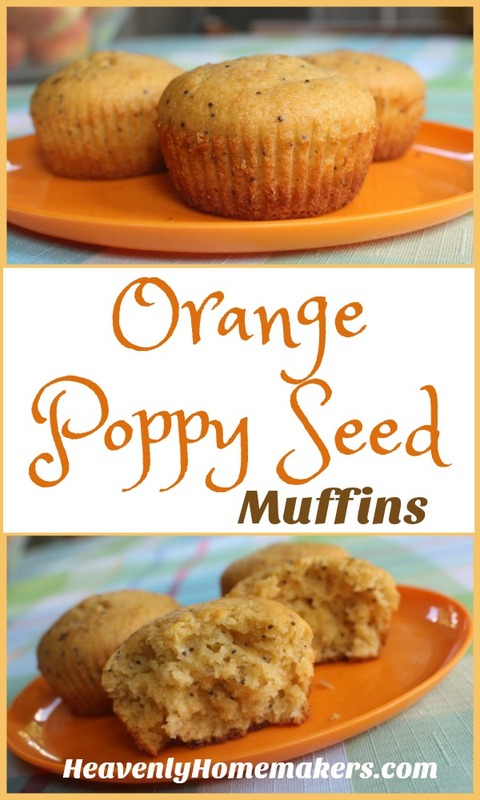 By the way, you’ll likely notice the similarity of this muffin recipe with my Orange Glazed Poppyseed Quick Bread. 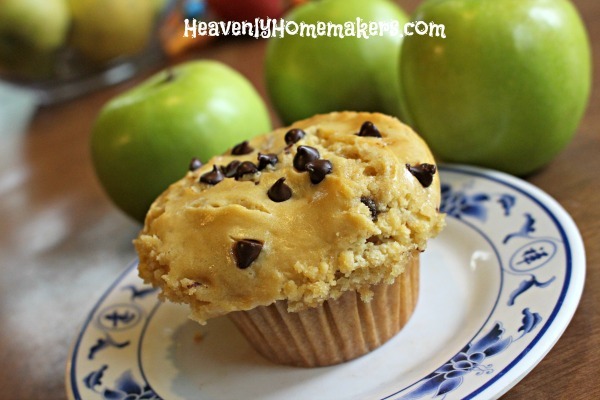 I tweaked that recipe just a bit to make these simple muffins. I love how they turned out! Pssst! 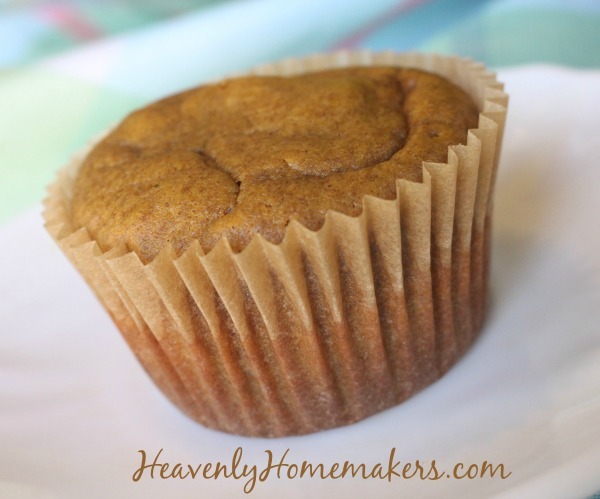 Want to keep Muffin Mix on hand to sub out for the dry ingredients in recipes like this? 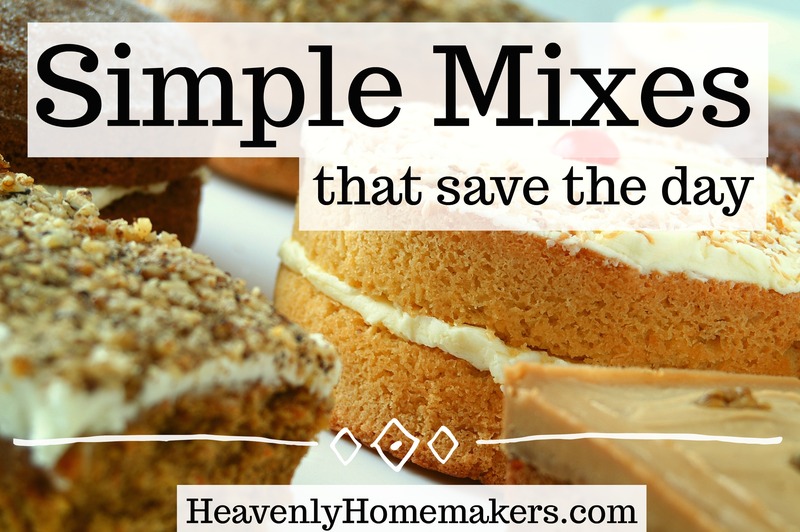 Simple Mixes to Save the Day truly do save my day over and over. 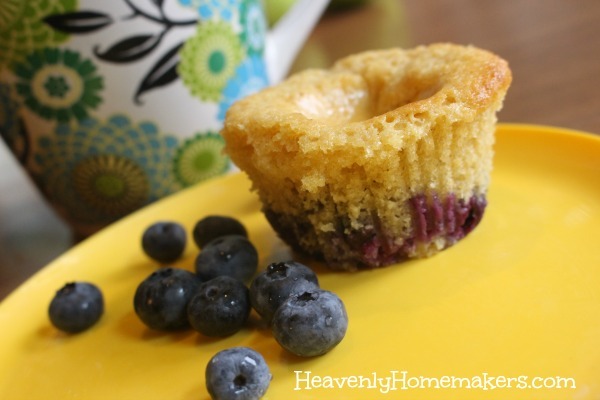 Find our Muffin Mix Recipe and many more in this delightful treasure! Once upon a time I had a box full of fabulous peaches. 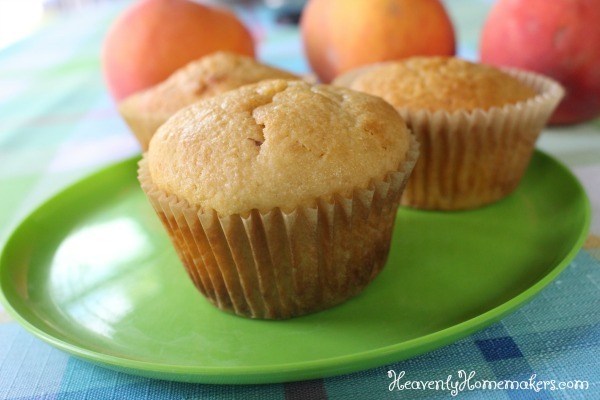 So I used a few juicy peaches to make these Peaches and Cream Muffins and the family declared them to be delicious. Good talk. 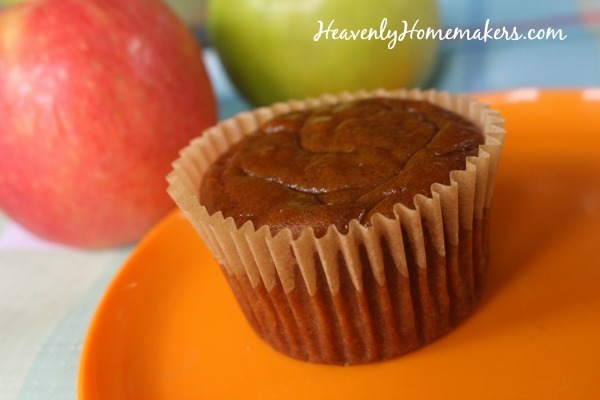 Allow me to share a few secrets to making the most deliciously moist muffins – even if you are baking with whole grain flour! Stir in some sour cream. This makes the muffins moist instead of dry and crumbly. So yum! 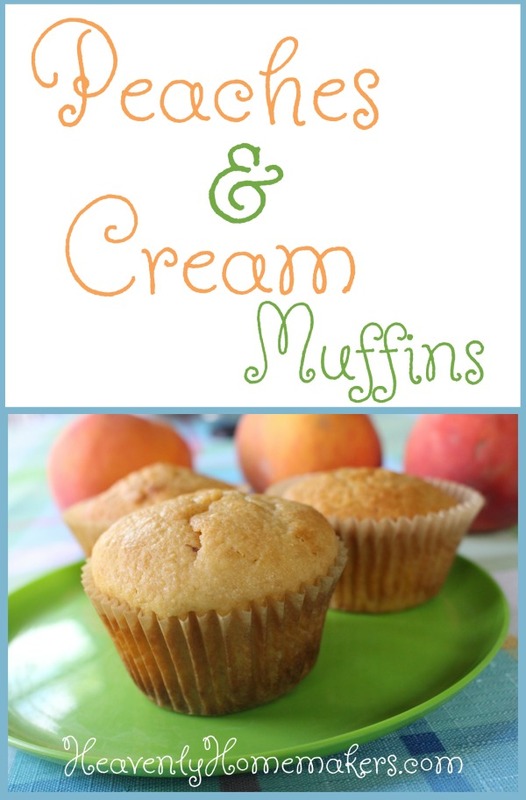 One of my favorite, favorite tricks to making these Peaches and Cream muffins even easier to whip up is to use the Muffin Mix recipe in this Simple Mixes to Save the Day eBook. Use 4 cups of Muffin Mix in place of all the dry ingredients in the recipe, and you’ve just cut out much of the work involved in stirring together these muffins. I LOVE having all those homemade mixes on hand! This recipe is quite versatile! Sub out peaches for berries or apples. Stir in some cinnamon. This recipe is fun to play with! Stir together dry ingredients in a mixing bowl. Add sour cream, milk, eggs, and melted coconut oil and stir until just combined (do not over-stir). Be sure to check out Simple Mixes that Save the Day. They truly do save my day – many days a week! There’s so much yum in there! I’m not sure why I saved these for last. Perhaps because most have declared them to be the best of them all? You be the judge. They are all amazing. How are your holiday plans coming? Have you been Getting Ahead for the Holidays? I can’t recommend it highly enough!